Alfreton Town registered an historic first ever win at Boston United as Reece Styche's sixth minute cracker secured three points in another solid display on Boxing Day. Billy Heath made just the one change from Saturday's positive 1-1 draw with Stockport as Tom Platt came in for Michael Collins in midfield. Callum Chettle made the bench. With a great atmosphere in Lincolnshire, the hosts started well as an early free kick from Walker on the right side of the box saw Sam Ramsbottom hold onto the shot well. We responded with several long throws from James Clifton which were cleared before Luke Shiels had to be alert and timed his tackle perfectly to deny a counter attack. With six minutes gone, the Reds took the lead as Clifton's throw from the right reached Styche who controlled brilliantly and blasted the ball into the bottom left corner with stunning technique to the delight of the travelling faithful behind the goal. The opener appeared to have stunned the hosts who were way-ward with a back pass and rushed within the back-line. We continued to press, Styche's cross for Richard Peniket was intercepted by Willis before Tom Allan battled well to win a free kick, Clifton took it but it came to nothing. Alfreton should have made it two after 22 minutes after another neat move saw Clifton's cross find an unmarked Tom Allan in the box but an unbeliveable save from Willis with his leg denied the Reds defender's header extending our lead. Willis was called into action yet again this time pouncing on Styche's effort after a neat one-two with Allan. The game lacked tempo and free kicks were in abundance throughout the first half, although we were creating the better openings. Shiels blocked an effort before Slew slammed an effort into the side netting in first half stoppage time. The second half saw the hosts press early on, Josh Wilde and Clifton partially cleared an attack before David Lynch glanced the corner away. Boston were dominant in the early stages of the second period but the Reds had their moments, Clifton's shot was deflected behind but the corner was cleared. It was nearly two for us as a long ball towards Styche saw the striker lob the ball over Willis but the effort hit the bar in another nearly moment for the Reds after 55 minutes. Boston produced their best opening after the hour mark when Wafula was picked out from a left wing cross but he couldn't hit the target as the chance went begging. Shiels headed away another cross moments later before Ramsbottom watched a long range effort fly just wide of the post. United kept coming and Sam produced a great block to deny Walker, Wilde cleared away a poor cross in before Curtis Bateson raced down the wing and crossed towards Peniket who went down, the penalty appeals were waved away. Styche who was a menace throughout led another Reds counter and picked out Clifton on the right, Clifton was taken out and the free kick caused a scramble before Willis held onto a chipped effort from Styche. 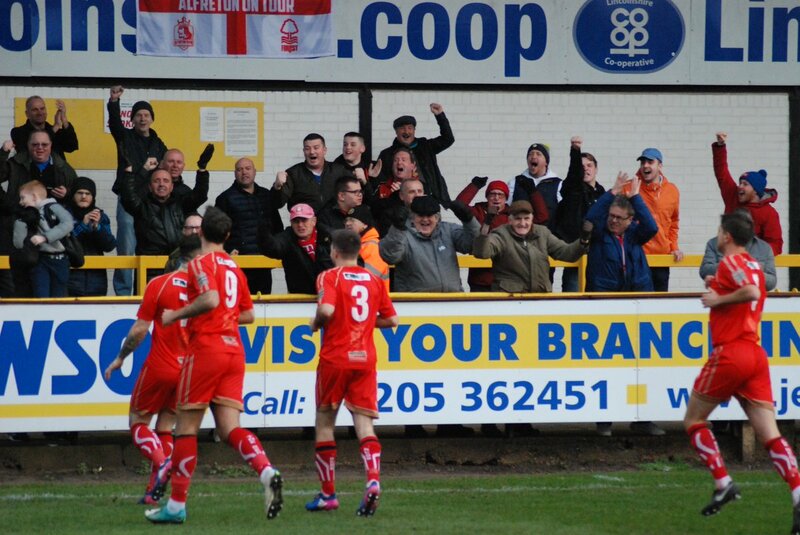 But the Reds held on for a massive three points and continue to look much improved since the Spennymoor display. Four points from the last two games and up to 13th in the table has given us a spring to our step with confidence in the side far better and Alfreton's performances are showing great solidity again. Next up, we travel to Southport on Saturday with a 3pm kick off. ATFCXI: Ramsbottom, Clifton, Wilde, Lynch, Curry (Hotte 76), Shiels (C), Styche (Sinnott 83), Platt, Peniket, Bateson, Allan. Subs Not Used: Chettle, Hobson, Nicholson (GK).